The media advisor to interim Egyptian President Adly Mansour, Ahmed El-Muslimani, said on Friday that Egypt and the African continent will remember Nelson Mandela with pride and honour, describing his death as "bad news for the whole world." In a press statement, El-Muslimani added that South Africa's anti-apartheid icon, who passed away on Thursday at the age of 95, was a symbol of "freedom, national independence and liberation." "His message will always be a source of inspiration for all those who seek justice, truth and goodness," El-Muslimani stated. 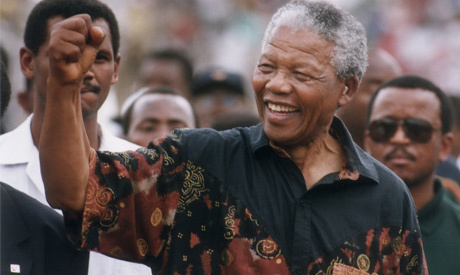 Egyptian Foreign Minister Nabil Fahmy said that Mandela was an "African symbol" who, along with other African leaders such as Egyptian president Gamal Abdel Nasser and and Ghanian leader Kwame Nkrumah, led the people of the continent towards independence.